You are currently browsing articles tagged Anti Virus. We have seen another increase in phishing emails over the last few weeks and this is having an impact on both staff and support services. We are advising that you beware fake e-mails such as ones pretending to be either from Voicemail, HMRC, image scanners, courier deliveries, company complaints etc, containing small “Zip” attachments. On Tuesday 27 March, ITS completed an overhaul of the Sophos infrastructure to bring us up to the latest protection they have to offer. The primary reason was to begin deployment of the new version 10 of Sophos for Windows, which adds a level of network protection not possible with version 9. This is in order to protect against emerging threats as we have been advised by Sophos. Protection is offered at the network driver level rather than only in common web browsers. Sophos can now assess if a PC is missing any Microsoft/Adobe/Java/Apple etc. patches. Servers running Sophos now operate with a “long term support” version (fewer reboots for upgrades). Faster updates with better resource usage (assuming Windows Vista or later). There has been an attempt today, 25 January, to trap people into giving out their login details for University of Reading IT systems. 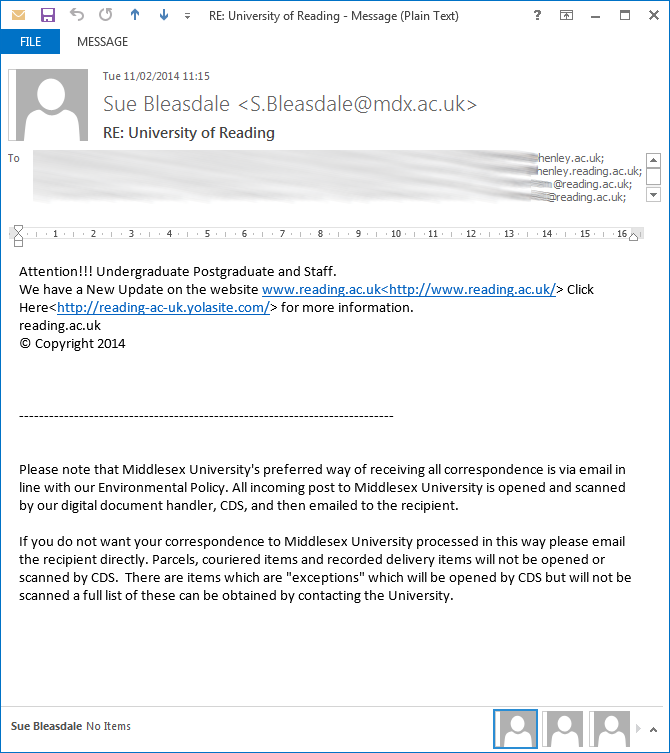 Should you receive an email with the subject line ‘Attention: Staff/Students’ simply delete it.